At Harken HQ in Wisconsin, if the water is hard, we still go sailing! This video features Steve Orlebeke, Harken Director of Engineering, racing the Honeybucket XIV on Lake Kegonsa. Honeybucket is an “E Skeeter” class ice boat, considered the “Formula 1” of ice boats, of which Steve is the reigning World Champion. Ice boating is a fast and furious type of sailing that is enjoyed across the upper Midwest and northern Europe. Instead of a hull slicing through the water, ice boats ride on three sharpened skates known as “runners.” Two runners are mounted on either end of a long plank stretching across the boat like an airplane wing. A third runner is out front on the bow, and is used to steer the boat like a rudder. Almost all ice boats feature a single, high-aspect mainsail. The organization and planning of an ice boating competition is also unique. Temperature, snow, and wind are all factored into where and when a regatta will take place. In many cases, regatta dates and locations are announced just days ahead of time, based on where the best ice can be found. Regattas are often “sanctioned” shortly after a deep freeze, with the goal of wrapping everything up before any heavy snowfall. Look for more posts on ice boating in the future! 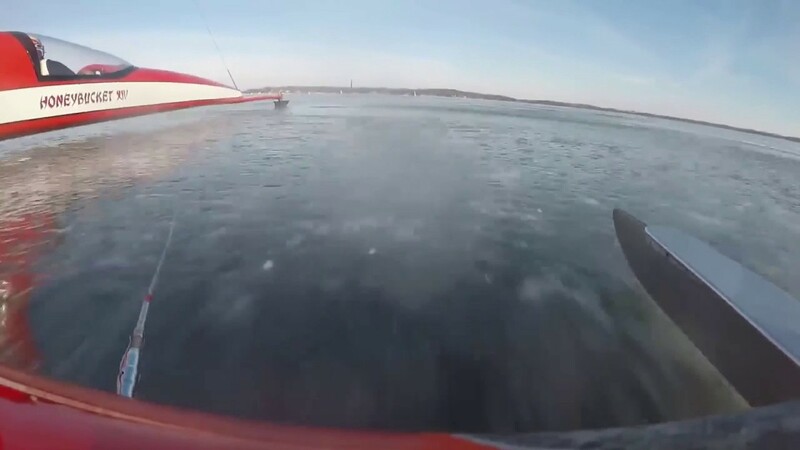 Click here to watch more of Steve Orlebeke’s ice boating. Click here to learn more about the sport of ice boating.